As part of a Bike Week bike ride down to Felixstowe, I turned off in Trimley to take a short cut. That path, if you can find it, brings you out in the perilous Port of Felixstowe among some Very Large Vehicles with Many Wheels. Trying to find a route to the safe haven of McDonald's, I circumnavigated the abandoned remains of Anzani House, once a BT stronghold. Near there is a petrol station, possibly called the Dock Services. And to the side stands the most unpromising portacabin you'll see. 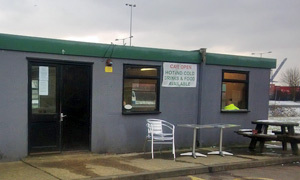 Except that the printed sign outside says "Cafe Open, Hot And Cold Drinks & Food Available". Enough said. We're there. It's a tad intimidating to even park on the forecourt of this particular truck stop given the relative size of the surrounding rigs. Entering the cabin with no name -- conditions outside are glacial -- one thing's clear: this sure isn't the Tea Boutique. To the left is the centre of operations. Straight ahead is a retina-troubling wall of luminous stars offering each and every permutation of all day breakfast. Pick one: that'll be the double egg & chips, a bargainous £2.85. I take my ticket, number 60, and go to find a table among the Bluetoothed hi-vis menfolk. Up comes Andy clutching ticket number 10, a curious numerical sequence. We're towards the rear near the 2.61kg tins of beans and the boxes of pre-chilled fries. View-wise, the Caravan Cafe on the Woodbridge quayside has the edge, just. There's little to relieve the eye except ads for driving jobs and a local martial arts centre. Eggs and chips, number 9, comes the shout. Ah, upside-down ticket. That's mine. Very good it is too, though the ketchup is weak, a fact I decide to keep to myself lest we find ourselves sealed in a container bound for Zeebrugge. Plates cleaned and returned to the nice lady, we make our excuses and walk over to the garage for a very welcome Costa Express takeaway plus a cheeky frangipane tart. Sometimes it's good to get back to the car. If it was a car -- Scania 113 360. If they were passing by -- Ryan Gosling.